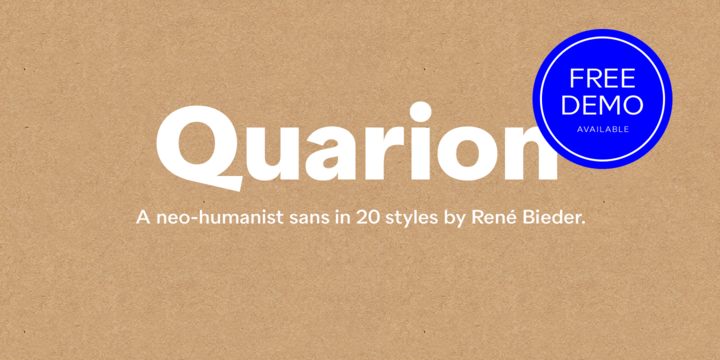 Quarion is a a contemporary geometric typeface created and published by Rene Bieder which is available in 10 weights (from Hairline to Heavy) with accompanying italics and a wide range of OpenType features. With a humanistic touch is characterized by circular elements mixed with medium stroke contrast. It works great on editorial use, advertising but also on analog or digital applications. Have fun! Price: starting from $39,00 for one font to $199,00 for all 20 fonts. A font description published on Wednesday, July 5th, 2017 in Fonts, Rene Bieder, Rene Bieder by Alexandra that has 2,739 views.